The City of Helsinki (Finland), striving to lower waste and reduce carbon emissions, is on track to achieve 100 percent sustainable public procurement (SPP) by 2020. To attain this goal, Helsinki has a number of policies in place to support the complete transition to SPP, including medium-term and long-term environment policies, with implementation periods up to 2020 and to 2050 respectively. The environmental policies’ aim is to have sustainability taken into account within all procurements carried out by the city. They state that both the material and ecological efficiency of the city’s departments will be significantly improved, and that these sustainability factors will be considered in all investments, procurements and notable projects by 2050. All city departments and subsidiaries will be trained in carrying out sustainable procurement by 2020.These policies are supported by a general strategy running the length of the 2013 – 2016 council term, which focuses on using procurement to improve environmental protection. 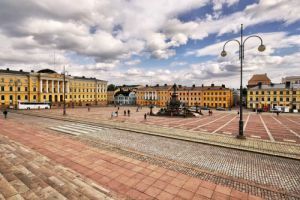 “The end goal has to be ambitious and therefore we have set the bar high,” said Jorma Lamminmäki, Procurement Director of the City of Helsinki’s Procurement Centre. The city’s concrete objectives include reducing the volume of communal waste by 10 percent compared to 2013 levels, and increasing the amount of materials reused from communal waste by 10 percent. To date, both small and large scale projects have been implemented, from the €50 million tender for SPP IT equipment, which was carried out with the help of the GPP 2020 office ICT calculator. For more information, view the March GPP News Alert.